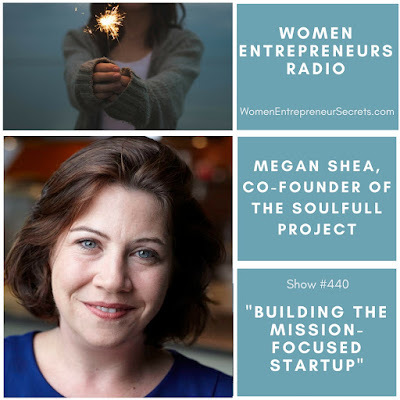 Megan Shea is the Co-Founder of The Soulfull Project, a startup company dedicated to making high-quality, wholesome food available to those in need. 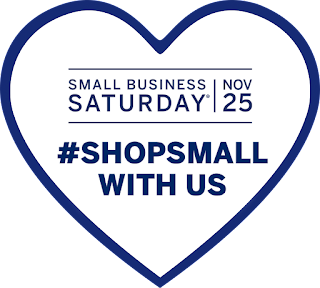 November 25th is Small Business Saturday®, a day to celebrate and support the local small businesses that boost the economy and invigorate neighborhoods across the country. Ready to Make a Change in Your Business? Want to make a change to your business, but can't figure out exactly how to get started? Feeling like your business idea no longer fits what you want to do? Are you jumping from one idea to another, looking for the right thing for you? Tired of social media marketing burnout? Find out where to focus your marketing. 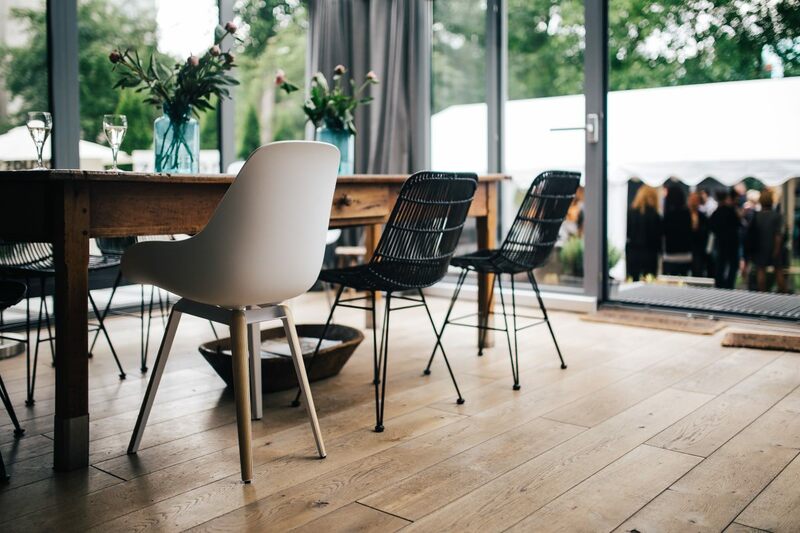 Connect with your ideal client in the place where they hang out. When you stop wasting time on what isn't working, you can get more list opt-ins and more sales. Ready to find out what’s next in your business? Not sure if you should offer a new service? product? get rid of what you’re doing? You can get the support to figure out what’s next and start your new thing. In these sessions, we’ll uncover what you really want to do next and what is no longer working for you. And we’ll create a plan of action for your next steps. I have learned how to identify this in others and how to show-up this way myself. Here are some tips that will help you step into this place and recognize others who are doing the same. 1. Come from a place of service yourself. Many people talk about this in the coaching industry – come from a place of service before you get on a sales call. In order to truly come from service, you must believe in something bigger then you. A force that is guiding you and supporting you. When you can adopt this belief, you will know you will always be taken care of and then you truly can operate from a place of service. Imagine not worrying about where your next client is going to come from or how you’re going to pay the bills. Think about how much differently you would show up in front of a potential client. 2. Come from a place of service in ALL areas of your life. For me the missing piece in the coaching industry was this. It doesn’t stop with business. It is about giving and being of service in every area of your life. Maybe a friend needs help or your child needs some extra love. Maybe it’s taking the time to help a stranger in line at the grocery store. This is a way of being. It’s also about giving legitimately. Not because you’re trying to get something in return, but you cause you genuinely want to help. You’re putting your own agenda aside and helping someone else. 3. Does it mean you don’t take care of yourself and practice self-care? No. Giving to yourself (receiving) is just as important. When you feel good you have more to give. I love the expression “giving from your saucer, not your teacup”. Think about when you’re happy and relaxed and how much more energy you have for others, as opposed to trying to give from a burned out, overwhelmed place. That causes resentment and anger instead. You will show-up differently when you’re more at peace and have so much more to offer others. 4. When you operate from a “giving” mentality instead of “getting” people will naturally reciprocate. They will remember you and think of you. You will be one of their centers of influence and in their circle of trust. Your relationships will be strengthened and meaningful. Business will take on a whole new identity and strengthen relationships and community in a powerful way. You will have some of the most deep and meaningful connections with other people. It’s this energy that is going to change the world. With love being the energy that is extended out between human beings and creating that powerful ripple effect. That is the world I want to be a part of. It's the first day of a new month...and I just did something that most of the coaches and personal development gurus I know might say is crazy. I have a board in my office with my big goals listed out on it (you know, the one I can see every day so I can focus hard and manifest it in to being) and I decided to wipe it out. The numbers, dates and deadlines along with it. I took our vision box and emptied its contents in to the trash. No - I'm not having a midlife crisis and I'm definitely not throwing in the towel. This purging and feeling of deep release is leading me in on a straight path to opening myself up for even more. I am letting go of the conditions and what's more, the attachments that have affixed themselves to my goals themselves. Like the tiny Remora fish next to its sizable host, The Great White Shark, our goals can at times bring with them uninvited conditions, partners and strings. After spending the last 15 years of my life working with big dreamers and high achievers, I have witnessed more attachment and conditions riding sidecar to the big goals more times than I can count. I've learned that when we envision our goals as finish lines and we map out the course with the corresponding deadlines for ourselves, there can be a tendency to see any outcome other than the trophy as a big ol' fat failure. We set our sights on the prize, we put our heads down,charge ahead, refusing to stop until we get there even when all signs are pointing to a course correction. But what if we stopped because somewhere along the way we discovered that we didn't want to run that particular race anymore? I can remember standing in the hallway of my corporate career...the name on the door, more meeting invites than I could keep up with and big expectations. I was walking back to my office one day and I watched the big boss down the hallway. I watched him shaking hands and laughing and welcoming donors in to his office to talk about their investments in the upcoming capital campaign. I didn't want to sit in that chair. I didn't want that life or career, yet here I was plugging away, day in and day out for it. I was literally being groomed for that seat and I didn't want it. Have you ever been in a space and time in your life when you were living a life that no longer belonged to you? Our greatest opportunity is to develop a greater ability to listen to what we are being called to. But here's the thing; when our commitment is to stay in alignment with our deepest truths at all times, we have to get really real about what is and isn't congruent for us to shift our trajectory. What I mean is; we have to get honest when the goals we're chasing are no longer the goals we want. And we have to be okay with wiping the slate clean, even if it means doing so before we've been able to check that box. The launch that flopped, that dream client and the nightmare one, too. The way your body feels and looks. The way you feel when your feet hit the floor in the morning. Every single little strand of information is a feedback loop helping us navigate our lives and live more firmly planted in our truth. When we look at life in this way, failure simply cannot exist. When we are tenacious in our approach to experiencing life more fully, serving in an even bigger way and pivoting when we are called to pivot…our lives transform. We begin to seek the "data" in our lives rather than the affirmations for our achievements. When I gave my notice at my corporate career, it came as a surprise to some my colleagues, but the ones who really knew me...the ones who saw in to my heart, they could not have been more supportive. It's funny what happens when we give ourselves permission to change course, to reroute and drive in the direction of what feels like home to us. If you're feeling that urge to wipe the slate clean in some aspect of your life, career or business, I urge you to remind yourself that it's never a loss to start over with new information. Trusting yourself is always a win. And the wide open space where your old dreams used to live makes way for a whole new world of possibility. About the Author: Amber Lilyestrom is a transformational branding & business strategist, writer and speaker. 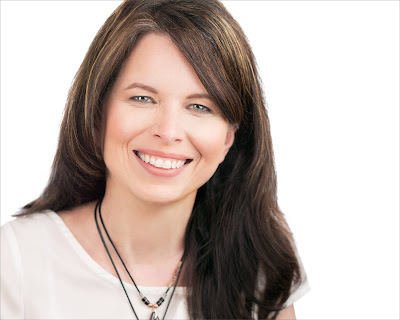 She has been featured in Entrepreneur and Working Mother Magazine and is the host of The Amber Lilyestrom Show podcast and helps entrepreneurs turn their passions in to heart-centered brands and thriving businesses. You can learn more and connect with Amber at www.amberlilyestrom.com. America’s family businesses are in crisis. 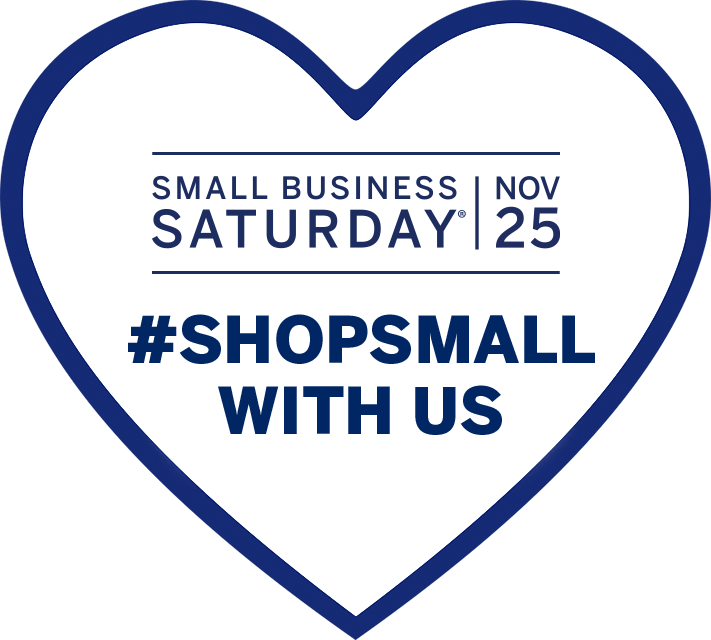 From huge, multi-national corporations to tiny, local mom and pop shops, such businesses form the backbone of the American economy – and yet a whopping 70 percent don’t make it past the first generation. A mere three percent make it past the third generation. This reality not only causes a huge dent in the U.S. economy and job market, it reveals a deeper fracturing in American families, with older generations finding themselves unable to communicate their vision and values to the next. Why is this? Why do so many family businesses fail? What does it take to have a strong, sustainable family business? And how can entrepreneurs make it so that their business not only survives, but thrives? In her latest book, “How to Make Your Family Business Last,” set to hit shelves on October 10th, bestselling author and acclaimed speaker Mitzi Perdue offers a fresh and exciting take on these questions. Combining academic research with practical, experiential advice, Perdue lays out a comprehensive plan for families and entrepreneurs who want to create a lasting legacy. Mitzi is a businesswoman, author, and a master storyteller. Her most recent book, “Tough Man, Tender Chicken: Business and Life Lessons from Frank Perdue,” was a bestseller on Amazon. She is also the author of, “I Didn’t Bargain for This”, her story of growing up as a hotel heiress. She is also a professional speaker on family businesses, drawing on her lifelong observations as a member of the Henderson family (the family behind Sheraton Hotels), and of the Perdue family. 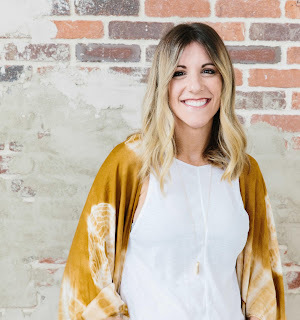 She has presented in cities all across the United States on how to embed a positive culture across generational lines via practical, effective tools and tips. As a nationally syndicated columnist, she has written more than 1600 articles, and as a nationally syndicated TV hostess and producer, she produced more than 400 half-hour shows. Additionally, Mitzi is also the founder of one of the larger wine grape companies in California, and she is a former president of the 35,000-member American Agri-Women, the oldest and largest American farm women’s organization. 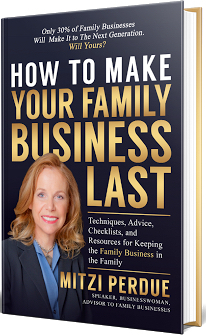 Purchase book: On Amazon at https://www.amazon.com/Make-Your-Family-Business-Last/dp/1884108075 or on her website where they can also download a chapter for free, https://mitziperdue.com/. Deb Bailey: Welcome to the blog, Mitzi. What are some of the important points in your book? "You can't always be right!" "You are a steward for future generations." "Relationships are more important than money." "Be someone whom others are justified in trusting." "You're part of something bigger than yourself." "You have a responsibility, not to just yourself or your family, but also to the employees, the consumers, the lenders, the suppliers…in fact the whole community. In other words, it's not all about you!" Deb: Those are certainly important things for family businesses to focus on. What inspired you to come up with the idea for your book? 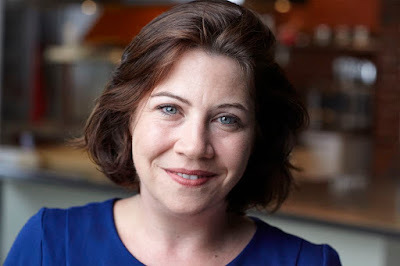 Mitzi: I wrote these three books to share some of the ways that business families can join the 30 percent of family businesses that make it to the next generation--as opposed to the unfortunate 70 percent that don't make it to the next generation. The pain that this causes in human lives can't be overestimated. When a family business fails, it doesn't just injure the family: It harms the employees, the suppliers, the consumers, the lenders, and in the end, the tax base of the whole community. On the other hand, when a family business does well, at its best it can be a blessing to all the people whose lives it touches. Deb: Well, I think your family business has done extremely well! You have a lot to share. 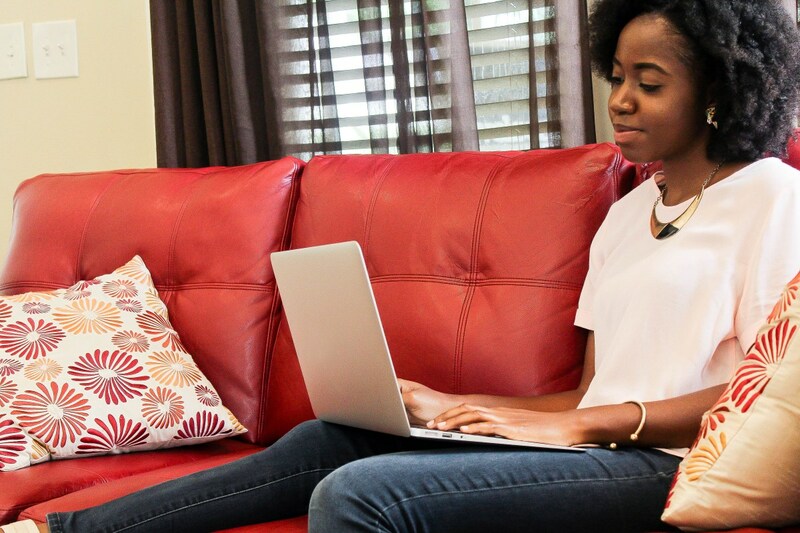 What advice would you give to women entrepreneurs who are just starting out? Mitzi: Don't let fear of failure keep you from trying! Instead, redefine failure. In my own career, up until my early 40s, I had never really done much with my education or whatever abilities I had. Then one day, I realized what was holding me back: I was afraid of failure. That day, I decided to redefine failure. For me, the only real failure would be not trying and not giving my all. My attitude ever since has been, "Just the act of trying makes you a winner. As part of trying, you'll have learned new things, met new people, acquired new skills, and you'll be better positioned for the next time you try." This played out in a remarkable way in my own life. As I said, up until almost my 40s, I really hadn't done much with my life. But that year, I began trying for some things I hadn't dared try for before. I decided to no longer fear rejection slips and began submitting articles to magazines and newspapers. I auditioned for a television show and then a radio show. Within one year of losing my fear of failure, I began a career that led to my becoming a syndicated columnist, a TV hostess, and a professional public speaker. It also led to successful real estate investments. I got into women's agricultural politics and had the extraordinary joy of being president of America's oldest and largest farm women's organization. Losing my fear of failure has meant gaining undreamed-of successes. But all of this meant huge amounts of efforts and countless times of falling on my face. And by the way, although I'm in favor of a positive attitude, I'm even more in favor of working like crazy, including studying, taking courses, attending conferences, reading books, practicing…in short, doing everything you can think of to improve your odds of success. My challenge for each of you is: Are there any areas of your life where fear of failure is holding you back? When you try for something, are you giving it everything you've got, or are you holding back? Try redefining failure: It's not failure when you don't succeed; you're a winner for trying! Win or lose, as long as you gave it everything you've got, that means that your efforts will be laying the groundwork for future success! Deb: I totally agree! Fear of failure ends up destroying so many dreams. Speaking of dreams, a lot of people dream of becoming authors. Any tips to share with someone who wants to be published? 1. Less Time. The publisher I use, R.J. Myers Publishing & Consulting Co. can have your book in print six weeks after you give them the final copy. With a conventional publisher, you'll probably have to wait a year. 2. More Money. I've rarely made much money with conventional publishers because I was lucky if I made a dollar a copy. But with self-publishing (and this will vary according to the length and layout of your book), I can pay $5 a book and sell it for $20. The profit all comes to me. 3. Artistic Control. Trade publishers rarely allow you to control the layout or the cover design. That's important to me and I've been much happier with the results when I've been heavily involved. 4. Distribution. The trade publisher can get you in book stores, but since 70 percent of books are sold on-line, and since 80 percent of my books are sold as part of my speaking engagements or media appearances, having the book in book stores isn't a big deal for me. Deb: 20 books! That's terrific. Do you have a favorite writing environment? Mitzi: Yes, my writing environment has to be phone-free. All my close friends know that I don't use the phone when I'm writing, and they also know that this isn't directed at them: I'm that way with everyone. I not only turn off the phone, I have it in another room so I'm not tempted. 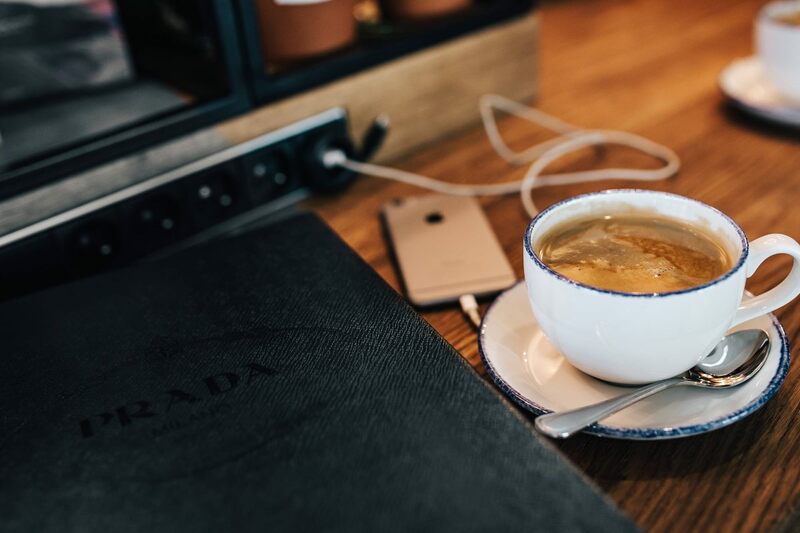 For me, phone calls, even if it's only a five-minute phone call, can take me 20 minutes afterwards to get back into the deep concentration that works for me when writing. I'm telephone dropout, by necessity. I take comfort in knowing that there are many Millennials who look on a phone call as an attack, and I understand their attitude. Deb: Trying to stay away from distractions so that you can write is a challenge. You've accomplished so much, what inspires you to do the work you do? Mitzi: I figure I have a mission in life, and it's to increase happiness and decrease misery. I love to joke that I would like to save the world, but since that's not on offer, the next best for me is to try to share current knowledge about how families can be high-functioning. Deb: That knowledge is very valuable. What do you think are the top 3 traits an entrepreneur must have? Mitzi: I'm in favor of all entrepreneurs reading this. It's so easy to put all your effort into building your business while forgetting the importance of family. What good does it do to succeed financially and fail as a family? 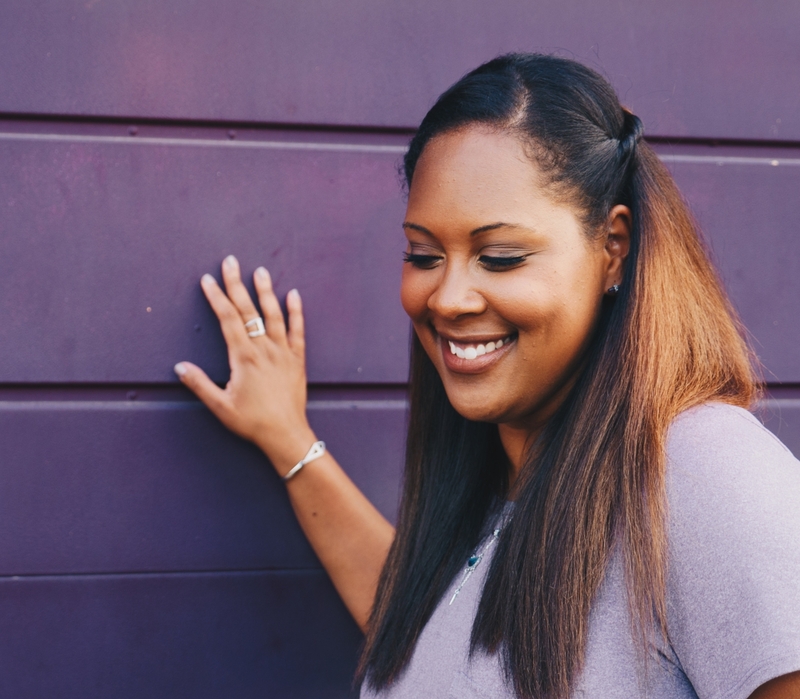 Our deepest sources of happiness over time will come from our intimate relationships, and it's worth putting in the time and effort to get this right, and I'm here to show you how. I share the latest academic research combined with a lifetime of observing what successful families did to create and maintain a strong, loving, high-functioning family. 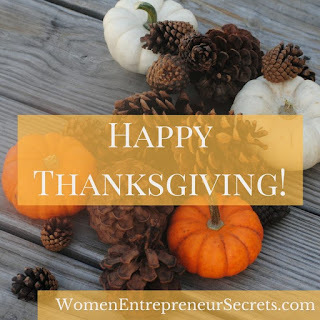 Deb: Thanks so much for joining me on the Secrets of Success blog. Please share where your book can be found. Mitzi: I enjoyed being here! If your readers would like an autographed copy, they can have it for $10 by going to this web address: http://mitziperdue.com/discount/ How to Make Your Family Business Last is normally $27.95. is nine years old this week! Entrepreneurs from countries including, the United States, Canada, Mexico, Singapore, Tanzania, France, Ecuador, Uruguay, Germany and the United Kingdom have been featured on over 400 episodes of the show. 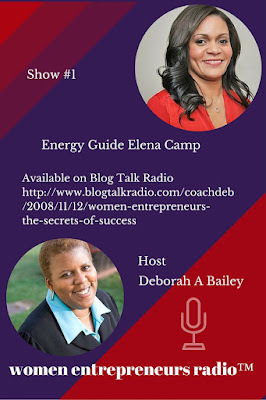 "The whole experience for my interview with Women Entrepreneurs Radio was seamless. Deborah's team was efficient and accurate in communicating the details, and the process was well organized. Deborah herself immediately put me at ease. From the moment we started talking I felt comfortable with her. She was prepared with questions to guide the conversation and bring us back on track whenever necessary, but listened and allowed the conversation to unfold. I enjoyed our chat, and I am glad we get to share it with the listeners." "I found this podcast last week while on social media and I haven't stopped listening yet! The interviews offer so much value. I really enjoyed in episode with Melinda Chen in her discussion about selling to big clients. She provided great insight on who to sell something I am not always comfortable with. I also enjoyed Ronnika Ann, she is such an intellegent young lady with a wealth of information. I can't wait to listen to all 300+ episodes. I Love this Podcast! Keep up the great work!" Topic: "How to Turn Pain into Purpose"
Hilary L. Jastram is the personification of turning pain into purpose. As a chronically ill entrepreneur, helping others craft their missions and messages wasn't enough. She wanted to improve the resources and support for entrepreneurs who are sick and disabled to help them find their own brand of success. In September 2017, she launched Sick Biz, the only organization of its kind and a non-profit organization to help this very special community. 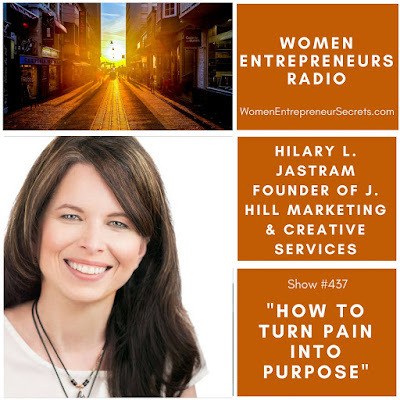 Hilary L. Jastram is the founder of J. Hill Marketing & Creative Services, an agency specializing in premier copywriting, editing and book editing for Fortune 500 brands and the “one-percent,” superstar entrepreneurs. 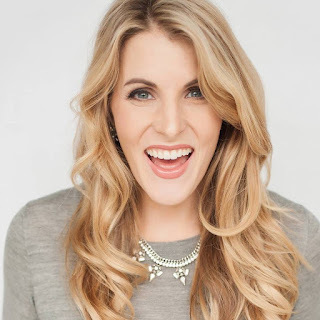 She is an author, editor at The Good Men Project, and contributor to Influencive, The Huffington Post and The Mighty, among other large-scale publications. To date, she has published over 150 articles on business and personal development. 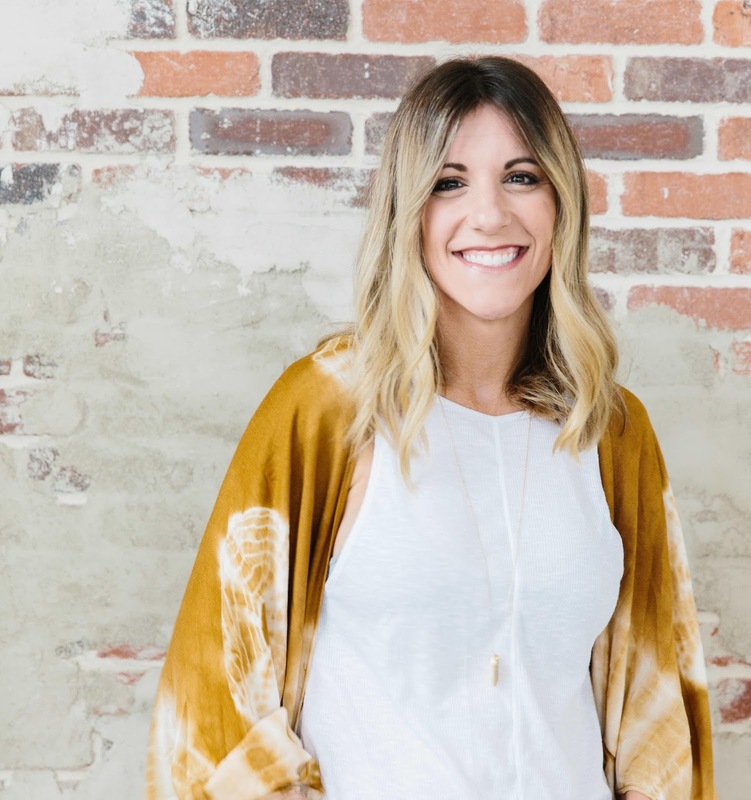 She is also the founder of Sick Biz, "an organization dedicated to providing support, resources, hacks, and hope to entrepreneurs affected by chronic illness, pain, disability, and sickness." Listen to the Sick Biz Buzz podcast for more inspiration and prescriptive insights on living a motivated and emotionally healthy life. Topic: "Start Balancing For More Happiness & Success"
Kristy Dickerson, keynote speaker, businesswoman, and active CEO and co-founder of STARTplanner, has devoted her life to providing hope for individuals who are looking to achieve balance, success, and happiness in their lives. Dickerson is a sought-after keynote speaker thanks to her relatable story, valuable advice, no-excuses attitude, and upbeat personality, which she instills in all aspects of her brands. She believes and preaches that individuals have the ability to do anything they want. 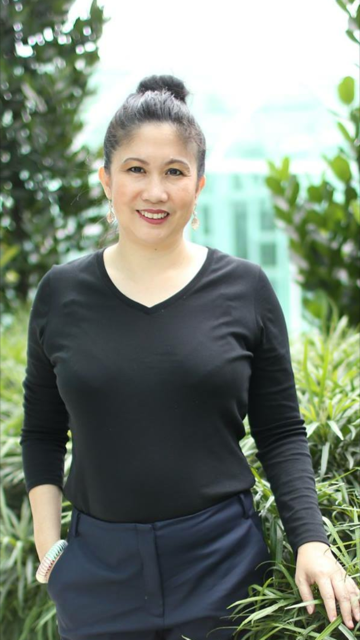 Featured in Forbes, Entrepreneur, and Inc.com among others, she is a powerhouse, showing others how to be productive and make things happen. 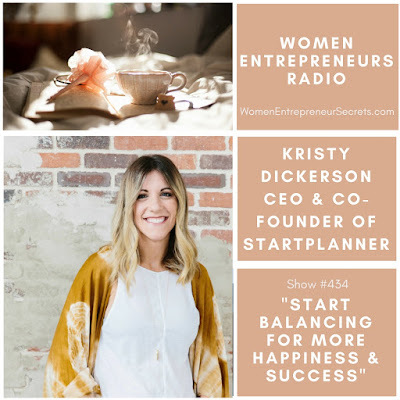 Kristy is author of Start Balancing, a no-excuses book that gives you practical hacks for productivity, solutions for being efficient, and inspiring and relatable advice for daily application, allowing you to find your version of success. Think of the traditional sales funnel as a casualty of today’s digital innovations. The internet, mobile access and smartphones, and the social networking web have transformed the current sales landscape into one where the funnel no longer applies. According to a survey done by SiriusDecisions, the buyer’s journey is now 67 percent digital. Our current unrestricted access to information has changed the way people make purchases. Buyers go through the sales funnel not from the top down. Instead, they come in at varying stages, navigate the funnel erratically, and consume content at every stage of the buyer’s journey. This puts your content marketing – as well as its offshoot, video marketing – in the forefront. Is your content marketing aligned with what your sales team needs, in order to do the job of developing relationships and closing deals? Is your sales team armed with marketing collateral suitable for the new sales environment? 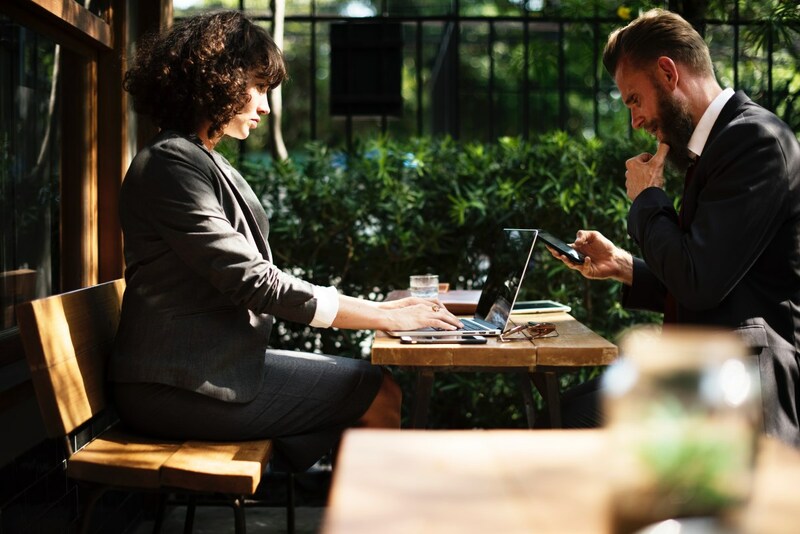 A study by the 2014 Marketing Leadership Council of CEB (now known as Gartner) claims that 57 percent of the purchasing decision have been made even before a customer meets a salesperson. This has limited marketing’s capacity to educate and influence, which are some of its primary roles. Access to information is at the heart of this reality. People are consuming content in increasing levels. According to research done by Hubspot Research in 2016, video content tops the list, followed closely by social media, news and long form business content. Of these sites, Facebook has the most impressive increase, up by 57 percent. Mobile usage is on an uptrend too. In fact, it has surpassed desktop usage, as of 2016. Here, social media and video content are in close contention for the top spot, at 52 percent and 49 percent, respectively. Mobile notifications have likewise increased by 34 percent, beating conventional content aggregators, such as RSS. It is worthwhile to note video content’s increased prominence as the leading content format for regular and mobile internet use. According to the Hubspot research, almost half the respondents watch at least an hour’s worth of videos a week. Leading video sites, Facebook and YouTube, likewise peg their views at billions of videos each day. 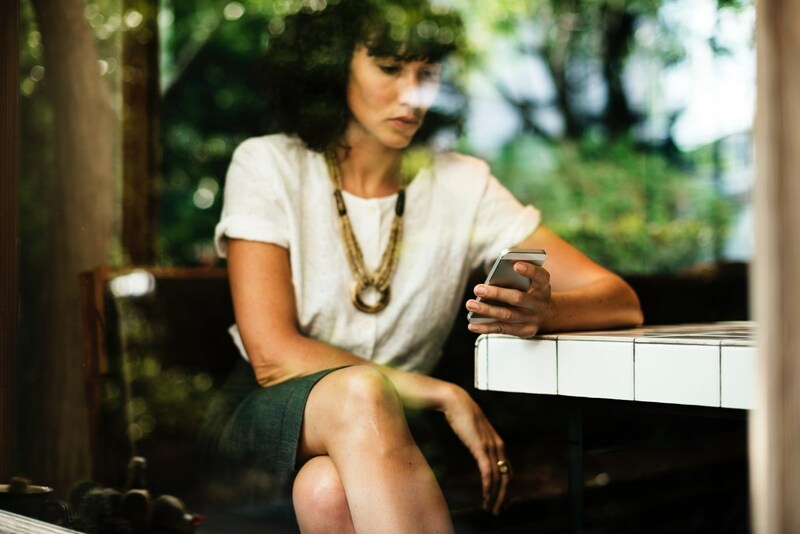 Interestingly too, another study – this time by Forbes – says that 75 percent of surveyed executives view work-related videos regularly, almost half of which are done through YouTube. Of these, 65 percent are spurred into action, such as visiting linked business websites. Another 53 percent extend what they had seen on video format by conducting further research. This behavior is shared across all executive age levels. All this implies an evolved B2B and B2C consumer. Buyers have become sophisticated, making the most of information that’s literally at their fingertips. They get online when necessary, wherever they are. They look or ask for information. They can make decisions on the spot, even without the intervention of a sales rep. The biggest challenge for marketing and sales teams today is penetrating this web of information, such that you are still able to extend your message to your target audience. Research suggests that videos are the top format to get your full message across. Of course, this does not mean abandoning other content formats; there are advantages, depending on your industry. In the past, we’ve used the sales funnel to map your buyer’s journey: to see where your customers are, and to know and provide the information that they need and the marketing collateral your sales team needs. We need to rethink this funnel to consider the new realities of the digital sales landscape. Take the story of Sephora, as shared by its CMO Julie Bornstein. Sephora is a French chain of cosmetics stores that has been around since the late 1960s. As with others in its industry, it has relied on marketing to generate brand awareness. Word of mouth from its advocates or brand ambassadors helps too. 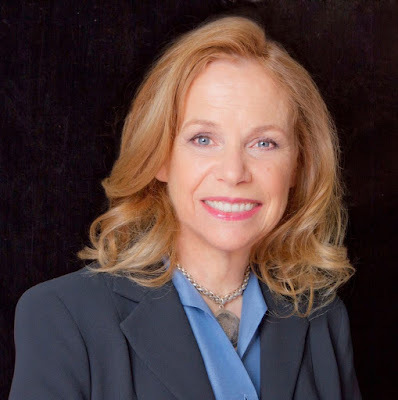 Bornstein and her team has seen how the sales landscape changed in the digital age. Everything had to be “quicker, faster and further.” So, they brought together all the stages of the funnel and instead, created a community. Within the community, people can discover solutions to their problems and learn about products. Users from different stages of their buyer’s journey can ask questions, decide/ change their minds, and perhaps eventually buy. They might even end up at an actual store, where a beauty specialist can assist them. But, even before that happens, a good amount of discovering and learning has taken place. It’s not far-fetched to think that the customers who do go to the store have made up 57 percent of their minds. Sephora’s case is not an isolated one. For both B2C and B2B businesses, customers are taking it upon themselves to learn about their options first. 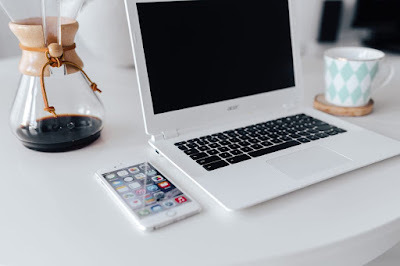 They visit company websites, support forums, blogs, review sites and social media venues to find out more about the product they’re interested in. They talk to friends – and even non-friends, for that matter, as long as they can be reached online – for recommendations and expert opinion. Even on a typical e-commerce site, such as Amazon, discoveries are made each second. A customer is a click away from buying or changing their minds. Rethinking the sales funnel is a way of understanding the new buyer. It gives us an idea where their touchpoints (opportunities for engagement) are, and how we, as marketers and sales professionals, can extend a helping hand. The funnel alternative Customer Decision Journey was popularized by McKinsey & Company, a global management consulting firm. Here, the funnel is completely removed from the buyer’s journey. 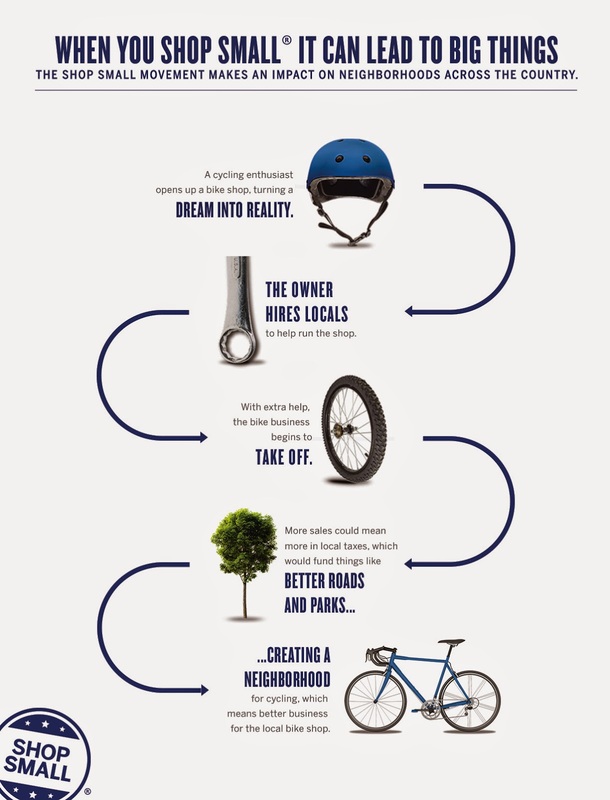 Instead, the process is a circle with one’s purchasing decision at the core. For instance, you don’t need to own a Tesla to follow Elon Musk on social media and be excited to see what he will do next. You don’t need to cook like a chef or be near any of his restaurants to watch Gordon Ramsay’s cooking demos on YouTube. But, what you become is an advocate. You are engaged with their brands, and would likely share interesting content that comes from them. He argues that today, there are a lot more opportunities to engage than to transact. And, while this does not quickly translate to sales, it develops a relationship that will be worth more than one transaction. “… Getting the sales and marketing teams to synergize is organizational goal number one. Every success grows from their collaboration and free exchange of ideas, because you can’t serve the customer right when your best people are working blind.” – Marshall Lager, Managing Principal at Third Idea Consulting, a social CRM and SMM consulting company. The Sales Funnel and Customer Decision Journey will always be there, referred to – even by us – every now and then. It is an easy way to compartmentalize the movement of our leads and customers. Within the limited capacities of these models, they can still work on certain situations. After all, what we really want is to align the content marketing that we do with what our target audience needs – and what our sales teams need, as well. To do this, it is best to leave these two models up in the attic to gather dust. Any approach or model that hinges on transaction or the purchasing decision is bound to miss out on the limitless engagements made possible by digital technology. Content is key to these engagements. In fact, it is of utmost importance during that span of time our market hasn’t reached out to our sales team. It is how we penetrate a web full of information and get our message across. And, further down the buyer’s journey, it is what we need to arm our sales teams with: engaging, useful content. The path to purchasing is no longer linear. Our customers follow a web of information, and go back and forth (up, down and around), before making a purchase. In some cases, the buyer’s journey takes months at a time, and after viewing several content. In others, it can take seconds. There are several dimensions to social influence. It is no longer the sole function of your marketing team to build your brand. The internet does some – if not, a lot – of the work for you. Keep track of your online reputation. There are several free and paid tools you can use for this. Don’t disregard your advocates. Whether or not they’re customers, these advocates have a social clout that can be to your advantage. When planning your content and video marketing strategies, keep them in mind. Focus on the relationships that you build with those you engage with through your content and video marketing. Don’t put transaction or the purchasing decision as your end goal; the digital sales landscape does not work that way. And, whatever you do, measure. You won’t likely get to the best approach to an aligned sales and marketing on the first try. (And no, perhaps not even on the second nor third.) There will be a need to calibrate and recalibrate your approach, until you learn the common paths taken by your customers. Do so methodically, through available analytics tools. Make sure to measure important metrics, over a period of time, especially when you recalibrate your approach. There are a lot to look forward to with marketing and sales teams that work together to take on the immense digital sales environment. I subscribe to a lot of email lists. In most cases, I'm subscribed because I want to see what that entrepreneur is selling and what information they're sharing about their industry. It's also a good way to keep up with trends. You can always tell what the hot thing is when you see it referenced repeatedly: Facebook ads, webinars, sales funnels, 'bots, podcasts, Facebook Live, online courses, list-building, etc. Let's be honest, most of the things I've mentioned above are not new. For instance, I've had a podcast since 2008. Webinars have been going on for quite a while too. And of course, funnels and list-building are definitely not new. There's so much talk about the list, but not about the people on it. The relationship with your prospects is the real reason for building a list. You want "warm leads" who will know, like and trust you. People who will tell others about you (word-of-mouth marketing). On some Facebook groups, I've seen fiction authors talk about how they have 2000 subscribers, or 5000 or even 10,000. Okay, that's great. But how many of them are engaged? How many are opening their emails on a regular basis? Numbers don't tell the entire story. Back in the day, people would get so excited when they had thousands of followers on Facebook and Twitter. Then people began to "unfollow" and "unfriend," realizing that just following anyone (and being followed by anyone) isn't always a good thing. You're building a relationship with your subscriber. That's the reason you want them on your list. And it's the reason they gave you their email address. What I see far too often is non-stop selling with very little relating. It turns me off as a subscriber, and my next step is to click the unsubscribe link. Here are 3 things consider if you're building an email list. 1.Don't be discouraged if people don't sign up OR open your emails. Keep in mind that most people selling list-building programs and systems are (usually) internet marketers. Email lists are the foundation of what they do. There are lots of "proven" systems to get you hundreds, if not thousands of followers. But which ones will actually work for you and your business? The person selling an online class about how to make money might get an entirely different result than the person building a list for her Etsy shop. Just because it works for the person selling you the solution, doesn't mean it will work for you. Be willing to test different things and do keep track of what works for you. It's not cookie-cutter. Oh, and everyone on your list won't open every email. They won't click on every link. There will be unsubscribes whenever you send something out. You'll be constantly adding subscribers and having them leave your list. It''s an ongoing process. But if list building were really that easy, everyone would have thousands of admiring subscribers opening every email and buying every product and service offered. According to the stats I get on Mailchimp, the open rates for professional services are around 17%. When I started out several years ago, I was regularly getting over 50% opens. There are less emails being opened and read these days. That's a fact. Email may be (statistically) the best way to reach your prospects, but you won't consistently reach every single subscriber on your list. 2. Decide on your intention for your email list before you begin. I send out a monthly newsletter to subscribers of my fiction email list. Usually I let them know what books are coming out, let them know what I'm up to and set up subscriber-only giveaways. My second email list is to build leads for an online course I'm going to be launching. How I communicate with those subscribers will be different than how I communicate with my fiction subscribers. But, the bottom line is communications. I want to make a connection with them. But I know fiction authors who don't send anything out. Or they only do it when they have a new book coming out. There are no hard and fast rules! 3. Don't ignore the other ways that your prospects and fans are connecting with you. Nine years ago I started Women Entrepreneurs Radio. 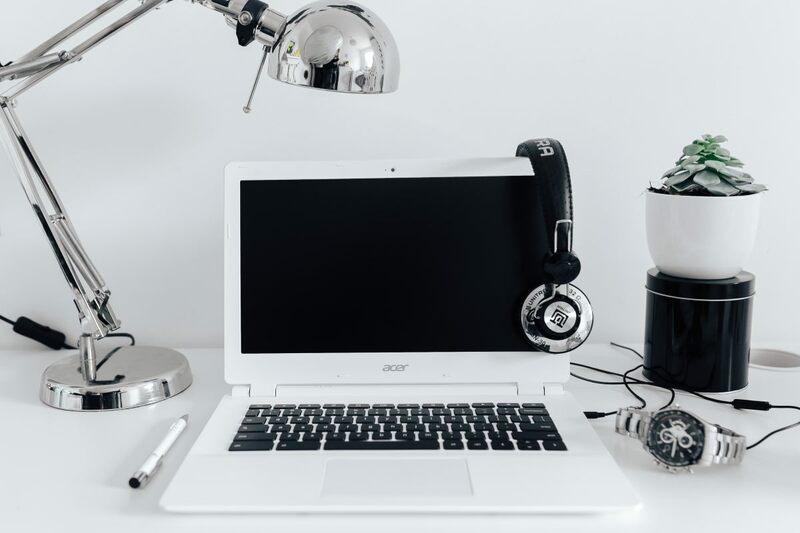 Through it, I've networked with hundreds of people and increased my discoverability (check out "Discoverability: A WMG Writers Guide" by Kristine Kathryn Rusch for more details on what that is and how to get it). Having my podcast has connected me to thousands of people and continues to market for me long after the show has been recorded. Email marketers encourage business owners to have lists because social media isn't something you can control. It's hosted on someone else's platform, and if the algorithm changes or the platform goes away, your followers/fans can disappear overnight. But, even though you can't control what happens on a social media platform, you shouldn't ignore the relationships you build there. The same goes for your in-person events. Give out your business cards or leave them with handouts or information they can refer to (and include your contact information). Marketing is constant tweaking and experimenting. There is no sure thing, if there were, we'd all be doing it! Don't be afraid to follow what works for you. Deborah A. Bailey is a writer, coach, and author of several novels and non-fiction books, including Think Like an Entrepreneur: Transforming Your Career and Taking Charge of Your Life. 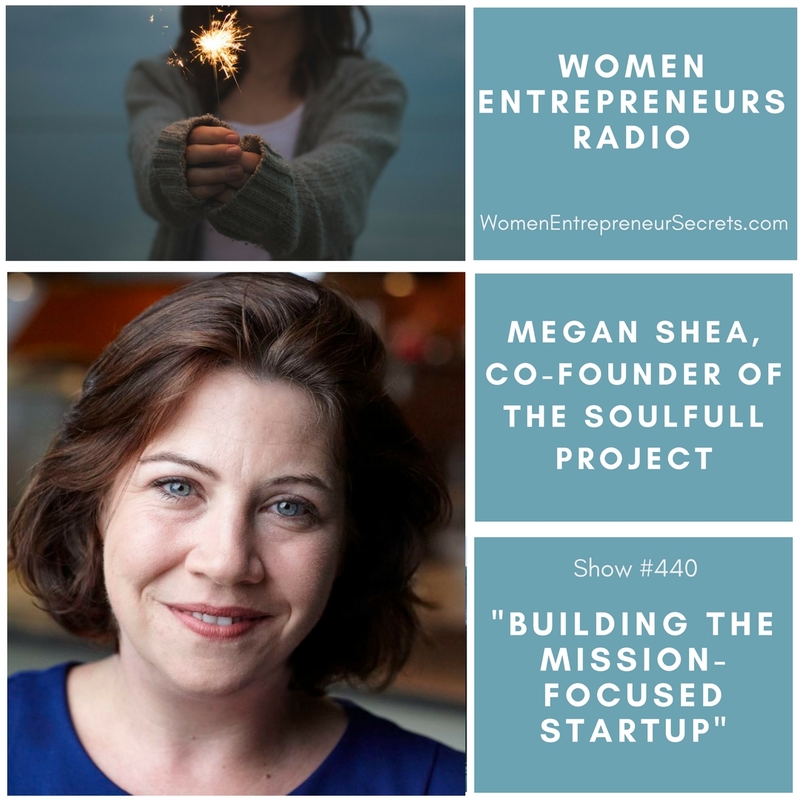 She's the host of the Women Entrepreneurs Radio™ podcast. 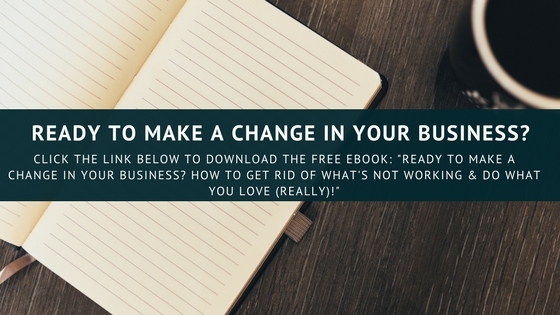 Download the free ebook: "Ready to Make a Change in Your Business?" 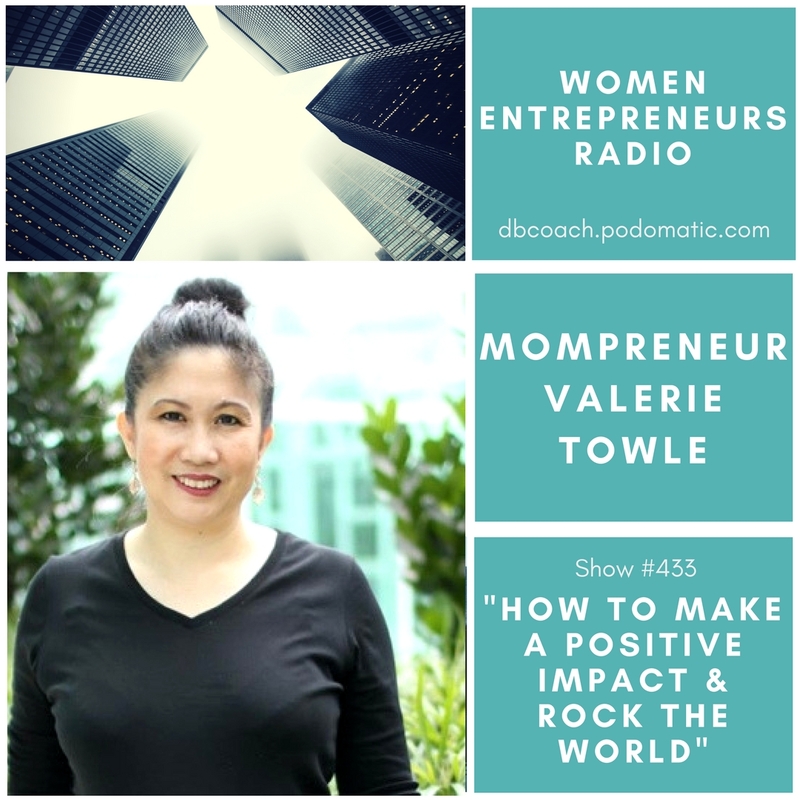 Valerie Towle is a mother of 5 and founder of Syaval garden furniture a organization dealing in solid timber furniture with 20 years experience. Her vision is to add value and a little cheer to the people she encounters everyday. She wants to share love so that the world we live in would be a better place for everyone. She wants to create a positive impact to all the women she meets out there and support them thru any struggles they might have. Valerie wants to uplevel women's lives to have more self worth and self love and thru associations such as Soul Rich Woman she is able to reach out to more and more women who are still searching. She believes one woman is strong but together we can rock the world.